No budget for gear or software? No problem! Without spending more than about $5 for gear or software, you can record audio at home using the same techniques used by the pros! Start learning how in the next 30 minutes. In 2015 all you need is a computer, a sound card and a microphone. With an inexpensive mic and some free software, you can create professional sounding audio in seconds. Most people simply don’t know how. We will show you step-by-step how set up your own studio on your computer using free software (called Audacity) and only one piece of equipment, which you probably already have – any type of microphone (even a $5 PC mic is enough to learn the techniques). This 9-lesson (16 total short but powerful videos) course is chock-full of incredible home recording tips. And the best part – You can start right now without having to spend more than $0-$5 in software or equipment. All you need is a computer and access to the internet. Jake, I want to congratulate you on an excellent job. 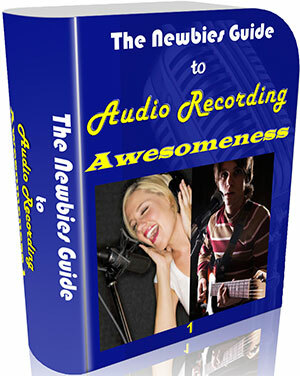 The Home Brew Audio Newbies Guide To Audio Recording Awesomeness is the best home recording tutorial I’ve invested in. I am simply amazed at what you were able to do on a home computer without using expensive recording equipment. Thanks! !